Hello and welcome once again to Pezhead Monthly. This past month wasn't as jam-packed with Pez activity as August was, but I was definitely kept on my toes. For one, my computer was out of commission for about a week and required a full operating system reinstall. That was not pretty, but they were able to save a bunch of my files, and the experience convinced me that an external hard drive would be a wise investment. (By the way, although I got back a bunch of my files, I was not able to keep the mailing list for the Pezhead Monthly Updates. If you were on this list, or would like to be, send me an e-mail if you'd like to be among the first to be notified via e-mail when a new issue comes out). Despite the agony of the computer, near the end of the month I discovered a fantastic new store (with a little help from a kind member of the Pez Community) and added the new Crystal Hello Kitty tin and one of the new Nascar haulers to my collection. Something tells me I'll be visiting that store again and again. This issue of Pezhead Monthly is jam-packed with Halloween goodness. For one, note that we now have a cover page. 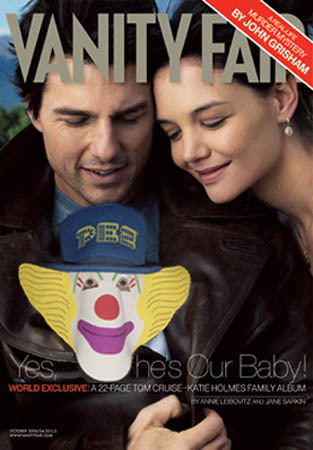 This month's cover features a scary movie indeed (also see last month's cover celebrating the new baby of Tom Cruise and Katie Holmes). Also, this month marks the premiere of a new feature of Pezhead Monthly called "Flip Side," with the first topic being appropriately Halloween-related. Also in this month's issue is an exclusive interview with the new Black Cat Pez dispenser, as well as some spooky Pez Poetry and the Pez Almost-Quote of the Month. For even more Halloween goodness from the Pezhead Monthly archives, click here. Finally, I'd like to offer a reminder that the 2006 Pez Poetry Slam is close at hand- in fact, it will be on the pages of next month's issue! I've already got a few submissions, but there's plenty of room for more. The deadline for entries is Tuesday, October 31. Click here for details. Pezhead Monthly recognizes that sometimes Pezheads have differences of opinions when it comes to Pez-related issues. It's part of what makes up the rich tapestry that is Pez collecting. This month, we are proud to introduce a new feature called "The Flip Side," where two different Pez dispensers discuss certain issues relating to Pez. This month's topic: would a Pez dispenser make a good horror movie villain? Offering their thoughts on the matter are two members of the Funky Faces set, Angry Pez and Cool Pez. This question really irritates me! You can NOT be serious! How on earth could a Pez dispenser be considered a good horror movie villain? Let's take a good hard look at Pez dispensers. For one, they are only 4 inches tall! They can't hold a cleaver or a chainsaw or any other weapon. The mere logistics of this question confound me to no end. And while we're on the topic, as Pez represents timeless and enduring toys and candy for kids of all ages, how on earth can they terrify their victims? When people see Pez a smile comes to their face, not a look of absolute fright and panic. I'd also note that Pez is available at all kinds of places, such as Wal-Mart, Toys R Us, and Walgreen's. Can you tell me what kind of horror movie villain exists in such wide open circumstances? Aren't they usually hiding in dark corners, ready to strike some innocent people when they least expect it? And for the love of all things holy- a Pez dispenser? As a horror movie villain?!?! What's next, The Yo-Yo of Doom? Let's face facts. Pez dispensers are meant to be displayed and played with and shared. They have no business chasing and murdering clueless teenagers, and this fine publication has no business even asking this question in the first place. For shame, Pezhead Monthly. For shame. I'm Angry Pez, and I approve this message. My distinguished colleague Angry Pez knows a lot of things about a lot of things, but on this particular topic I am afraid he falls woefully short. 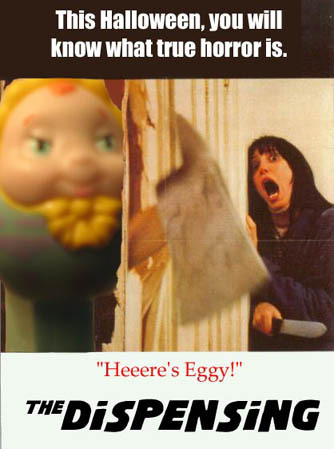 I for one think the time is long overdue for a horror movie featuring Pez dispensers. Of course Pez is good and Pez is great. This much is true. But you know who else is pretty great? Jason Voorhees and Michael Myers, two of the most awesome horror movie villains ever. Not to mention the classics, like Dracula and Frankenstein. Granted, those dudes killed tons of people, but I gotta say, cool is cool. I mean, the very fact that Frankenstein, Wolfman, and the Creature from the Black Lagoon are some of the most popular vintage Pez dispensers should tell you something right there. And yes, Pez dispensers are also small, and they are also available all over the place. But the way I see it, this would provide a perfect cover for them to carry out their tiny little acts of horror. People are so overjoyed when they get a Pez that they bring it into their house and display them. So it would be easy for the Pez to sneak up on these people when they are sleeping and totally bring the evil. As far as being too small to hold a deadly weapon, I know of a certain headless Pez dispenser who would respectfully disagree. So Angry, dude, I don't know why you've got your springs in a bunch. But loosen up, my brother, and think about how awesome it would be to have a Pez dispenser as a horror movie villain. I know I can dig it! This is Cool Pez, signing off. Cowabunga!